^ John E. Oliver. Encyclopedia of World Climatology. National Oceanic and Atmospheric Administration. 2005 [February 8, 2009]. ISBN 9781402032646. 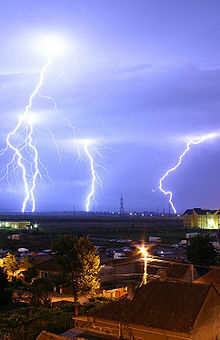 ^ Where LightningStrikes. NASA Science. Science News. December 5, 2001 [July 5, 2010]. ^ Picture of John Kaspar of the National States Rights Party speaking in front of the party’s lightning bolt flag (the flag was red, white, and blue) 互联网档案馆的存檔，存档日期February 3, 2013，.. Mauryk2.com (November 6, 2010). Retrieved on April 9, 2013.